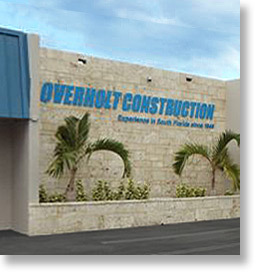 Overholt Construction is a full-service General Contractor/Manager located in South Miami Dade County, Florida. We are dedicated to a fully transparent process to budget and timely build your project. All companies are only as good as their people, and we staff our organization with professionals at every level. From Design Development to Certificate of Occupancy, we look forward to working with you on your next project. Thank you for visiting our website. Orange Bowl Stadium, West End Zone – 1963M.R. 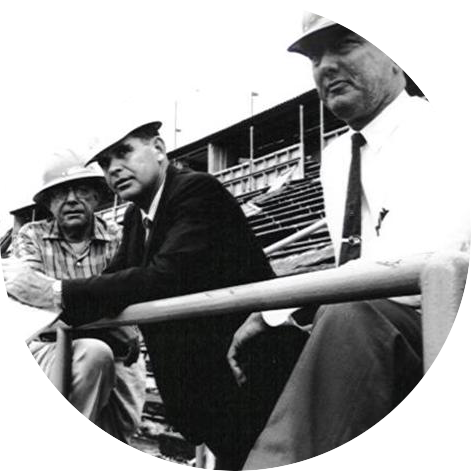 Harrison Sr., Rod E. Overholt, John C. Harrison Sr.
Today, Overholt is the product of a family heritage that traces its roots back through more than six decades of South Florida construction history. Principals Rod and Craig Overholt began their careers working for their father, Rod E. Overholt at MR Harrison, where he was a top executive for over 35 years. MR Harrison Construction, founded in 1925, was a firm instrumental in building Miami from a coastal beach town to the Magic City. In 1996 Craig and Rod Sr. founded Overholt Construction as a natural development of the family legacy. It grew steadily establishing itself in Commercial, High-End Residential and Infrastructure segments of the industry. Most recently, we have completed several major projects in the Automotive, Educational and vertical wastewater markets. Craig, his brother Rod, and our entire team continues the legacy today and into the future.